Thanks for answer, I see that plague lords will be for long time separate from AgeLessEra. Let's see what will happen in next year. 1. What I must to do that my faction "Plague Lords" was added to Ageless Era? 2. Can be it separate so that I can freely update my Faction? 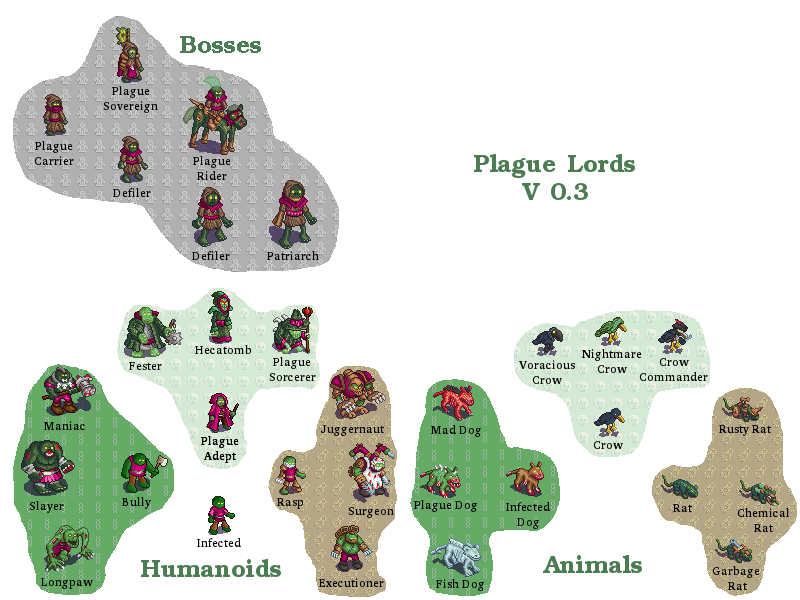 Added race skill "Plague" so it do not need to add to each attack and after killing enemy not only humanoids will spawn. Really nice looking modification, keep working. 1. When do you planning to add Japan? 2. I hear that Germans had plans to create some kind mega tank and "flying bell", do you gonna create that units? You are making nice progress. I can't wait to see more of your art. Last thing, can you make steampunk arts? Topic: How do you make units' pixel art? Re: How do you make units' pixel art? Furry nation, nice, i want see them in action. Did you think of using Sphinx?